Many people find themselves struggling to really take time for the breaks they truly need. They find themselves always making excuses for why they just can’t take that break yet. For others it comes easily to take time for themselves when they need it, and just kick back and relax a bit. 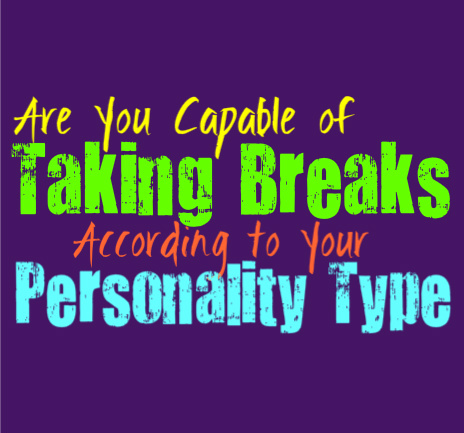 Here is how good you are at taking breaks, based on your personality type. INFJs do sometimes find themselves struggling to take a break, especially if they have a lot of responsibility in their lives. They do a lot for others and can easily feel guilty if they take too much time to just relax. At the same time if the INFJ does not take time to themselves they become truly exhausted and might become short-tempered. They can certainly have a hard time taking breaks, but eventually they come to a point where they are forced to do so or else they become truly overwhelmed. ENFJs definitely struggle when it comes to remembering to take breaks when they need them. They often work hard to juggle so many different things at once, and find it difficult to really take time to themselves. For the ENFJ there always seems to be something else they need to finish or get done, and so the break time always gets put off. ENFJs do sometimes overwhelm themselves with too many chores and responsibilities, making it difficult for them to take the breaks that they desperately need. INFPs are actually good at taking breaks when they know they need them. They sometimes take breaks without intending to, since they find themselves distracted by their own thoughts and inner minds. For the INFP it is important to take time for themselves, or else they become exhausted and overwhelmed. They are often capable of recognizing how important self-care is for their well-being, and so they do their best to take breaks when it is obvious they need them. ENFPs are actually pretty good at taking breaks when they need them, especially when they have been working hard. ENFPs know that they need time to relax and actually enjoy themselves, and so they don’t like overextended their responsibilities. ENFPs want to feel free to take breaks or explore something different, without having people constantly breathing down their necks about it. INTJs can struggle to take breaks, mostly because to them relaxing is often researching or analyzing information. At the same time they do struggle to take a break on certain projects or tasks, especially when they feel like they have a lot to get done. INTJs don’t like slacking on anything, and often feel like they could be doing more even when they are working hard. Taking a sincere break that doesn’t involve work or projects, can be a bit difficult for the INTJ. ENTJs do sometimes struggle to take breaks, especially if they feel like there is a lot that needs to be done. They focus so hard on pushing themselves to succeed, and often take on a lot of different tasks because of this. ENTJs don’t like laziness or inefficiency, and so sometimes taking breaks can feel a bit like they are failing in some ways. ENTJs do take breaks when they have obvious free time to do so, but they can sometimes find themselves overthinking about things they could be taking care of during this so called “break” time. INTPs can sometimes feel a sense of guilt when they take real breaks, and believe there is something they should be focusing on. At the same time they can struggle with motivation and so certain projects find themselves unfinished. For INTPs the balance of taking real time for themselves and finding a way to focus on their tasks, can be difficult. Even when the INTP does take breaks, they might find themselves feeling guilty about it. ENTPs do sometimes struggle when it comes to taking breaks, since they find themselves constantly drawn to different things. They are curious people and for them taking a break often means researching, or divining into a new project. They can struggle to actually sit back and just relax sometimes, and might feel a sense of guilt when they do this. They find themselves thinking about the many projects they should be finishing, but become distracted often. ISTJs are hardworking people, but at the same time they know it is important to make time for themselves. They are capable of taking breaks, as long as they feel like they have earned them. They often push themselves to get things done and are good at making certain deadlines ahead of time in order to really take a break. ISTJs enjoy having some time to relax and just be on their own or with someone special, and so they find a way to make time for this without feeling guilty about it. ESTJs are hardworking and focused people but they also believe in finding ways to really take a break when they need it. ESTJs often work hard and make sure to organize things ahead of time, so that they can take the breaks they really need in order to recharge. ESTJs are capable of taking breaks, especially when they feel like they have put in the time and really earned this for themselves and their loved ones. ISFJs do sometimes struggle when it comes to taking breaks when they desperately need to. If the ISFJ has a lot on their plate they want to be sure to take care of everything without fail. They can sometimes find themselves taking on too much so that they can properly provide for and take care of their loved ones. Sometimes this causes the ISFJ to feel guilty if they take too many breaks, even when they obviously need it. ESFJs definitely struggle to take breaks, even when they desperately need it. They often have so many chores and errands they are juggling, and find it hard to take time for themselves. They want to be able to get everything done perfectly, and fear that if they stop they might fail at something important. For the ESFJ taking breaks isn’t something that happens often or comes easily, since they can feel guilty when they actually do stop for a moment. ISTPs are definitely capable of taking breaks, especially when they feel they have earned it. They don’t like having to answer to other people, and prefer to make time for themselves when they need it. For the ISTP it is important to live in the moment, and so sometimes this means taking a break and just relaxing. This doesn’t mean they cannot be hardworking people, they just know how to balance these things. ESTPs often go through phases in their lives, and during some of these phases they can struggle to take breaks. When they are focused on getting certain things accomplished, they might have a hard time really taking a moment to just relax. ESTPs can also take on too many things at once, simply because they often act before thinking these things through. This puts them in a place where taking breaks seems almost impossible for them. ISFPs do believe in taking breaks, and enjoy just living in the present. For the ISFP it is about enjoy the moment instead of getting caught up in what might happen in the future. ISFPs know that it is important to balance work and relaxation time, and so they do know how to take breaks when they really need it. ISFPs are more interested in doing what feels right and in enjoying their lives. ESFPs are actually good at taking breaks, especially when they know they need it. They don’t like getting caught up on overworking themselves, and sometimes they just believe in taking a nice long break. For the ESFP it is important to enjoy themselves, and so they try not to obsessed over the things they should be getting done. Instead they want to focus on living in the moment and seek out the things that bring them a sense of joy.